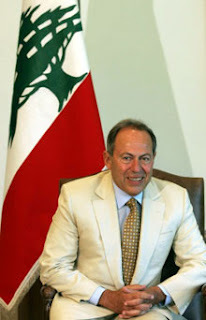 I remember in details the election of General Emile Lahoud to the Lebanese presidency nine years ago to the day. I had left the country the previous year and still suffering from acute nostalgia, a disease experienced by many fresh expatriates. One of my symptoms consisted of religiously following the latest developments in Lebanon through various news outlets and reporting back in real time to friends and family back home. Needless to say they were busy getting on with their lives and generally not impressed with this obsessive behaviour. I received the news of his election with certain unease. I never felt strongly about the man and was anyway naturally suspicious of anyone in uniform. But at one point I probably believed he was the embodiment of the sincere and honest military leader: The type who had his country’s best interest at heart and would work to bring back law and order to our vulnerable nation. I phoned a friend who lived in Beirut and for her own reasons shared my scepticism. We had a long conversation while in the background the city was on fire with hundreds from all sects celebrating. They expressed their joy from the various neighbourhoods, from Ashrafieh to Tareek Jdide and Ouzai using fireworks, the occasional machine gun staccato and other ‘traditional’ celebratory rituals. The feelings were genuine and the sense of hope overwhelming. We felt like the two only people who did not share this enthusiasm with our compatriots. Here I am thousands of miles away being a grumpy sod, time would prove me wrong! I thought… But it didn’t. Nine years later, still abroad but less obsessive, I receive the news of his departure not with relief but with resentment and fear. It is true I will not have to suffer the eternally tanned vain general receiving minor celebrities from obscure village associations anymore but the future still appears grim with another general in the pipeline. The future is indeed grim. I called my father today to ask for his opinion and thoughts about the current situation. He told me he can't remember the last time our government and leadership had so vehemently disregarded the constitution and steered away from facts as it is the case nowadays. You fear another general, I fear a general, 30 ministers, and 128 MPs that are running the county like a private company where they hold all the stocks. I also fear the 4 million us? Have we really not reached rock bottom as of yet? Are we this much in denial? Are we not offended that the 200 or so policians in Lebanon have not asked for our opinions/concerns regarding the direction of the country? Do we really believe what we read or watch in the news on Lebanon? What has taking sides been based on lately? Is the truth really lying in one person, coaltion, group, religion or is it more about principles and results? And if the latter is true, does anyone has anything to show on who has delivered so far? Just to make it clear Marwan I did not mean any particular general.I am just not comfortable with this overreliance on the army.The army did split in the past and is still affected by the deep divisions in the country. To expect it to rise above these might come at a very high price. I didn't think you were referring to Aoun in the first place. It's a question of perspective I guess...I'm not sure what we currently have is "better" that what we are anticipating. Could the high price of military rule wake us up? Because a government within a government, dirty campers in downtown Beirut, returning murderers/warriors, corrupt politicians, legislator pledging alliance to everything and anything but the Flag of the Republic, assassinations, a devastign war, a lame duck controversial government, etc...really really didn't.